This paper focuses on cultural patterns of Kalash people in order to explain why Kalasha is isolated and is not integrated to the mainstream Pakistani society? This paper will explain how Kalash culture is at the verge of extinction and is threatened by religious extremists while Pakistan’s State is silent and is not doing enough to preserve this culture or to integrate it in a positive way. The interaction between majority and minority culture also falls under scope of the paper. The paper discusses areas of difficulty between two groups. Back in 2008 when I visited Kalash Valley in Northern Pakistan I felt that I’ve had an atavistic journey to the primitive human society and within hours I felt myself to be a part of that fascinating culture which is based on pure collectivism. The nature loving people of Kalash Valley live in Northern Pakistan’s Chitral district’. Kalash people live in 12 villages of the valley. 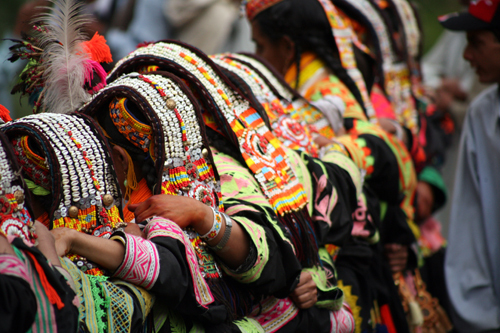 People of Kalash are described to be the last pagan tribe of Pakistan, some researchers call them animists. Kalash people call themselves to be animists because they believe that trees, stones, streams, mountains etc. all have souls or spirits. Kalash people and culture is also known as Kalasha or Kafiristan culture. Origins of Kalash people are not known exactly. There are views that Kalash people are descendants of Greeks. Some historians say they are descendants of Alexander the Great. 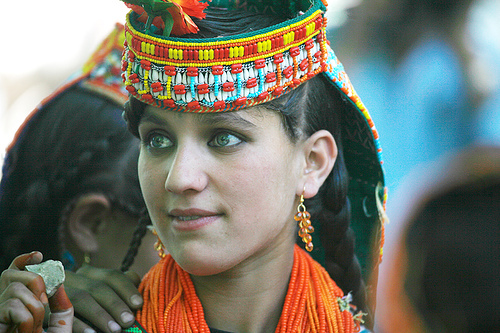 Some researchers say ‘the Kalash are indigenous to Asia and come from the Nuristan area of Afghanistan. Some say the Kalash migrated to Afghanistan from a distant place in South Asia called ‘Tsiyam’, a place that features in their folk songs.’ The people of Kalash believe they came from present day Nuristan province of Afghanistan. Nuristan province was also known as Kafiristan in the past. In 19th century, Emir Abdur Rahman Khan of Afghanistan forcefully converted them to Islam. Thus, Kafiristan was named Nuristan. Pakistan came into being in 1947 as a result of the partition of Indian sub-continent. Chitral as a result of Durand Line Agreement became part of Pakistan and Kalash people were now Pakistani citizens. Pakistan’s Constitution and Ministry of Religious Affairs provide protection to the people of Kalash valley. But this protection is de jure only and cannot be seen pragmatically, physically or empirically. Kalash culture is not academically explored and explained to a larger extent so far. There are many books available on its origin, genetic makeup of people, preservation efforts, threats it is facing emanating from fundamentalist political Islam, economy and history. But the culture itself is not thoroughly described, explained and analyzed. Due to extreme isolation of Kalash people, there is no other source available except the people (and their own sources) of the beautiful valley themselves. This section tries to explain the cultural makeup of Kalash people and gives a comparative analysis in this regard. Kalash-times website reports, ‘[n]owadays there isn’t leader or true elder, which some say has contributed to the downfall of Kalasha traditions.’ This gives us a clue that Kalash culture is not based on individualism as cultural patterns show us about North American culture. It rather resembles Japanese culture; or to put it more comprehensively and accurately, the Asian culture. Kalash people believe in one true leader or elder. In Kalash, a true leader streamlines and directs the entire social life which in every family is the head of family presently and for entire ethno-religious group, there is no representative. Like Muslims who consider their Prophet Muhammad to be their true leader, or Dalai Lama for Tibetan people, or Sai Baba for Hindus, Kalash have no such spiritual leader. While it is true that Kalash people don’t have a real leader, there is no way of democratic election of the leader in Kalash culture. The other important thing in Kalash culture is ‘spirituality’. They believe in one supreme, omnipotent God who will return them their holy book. According to Kalash culture, the people had a holy book which their forefathers buried at an undisclosed location. 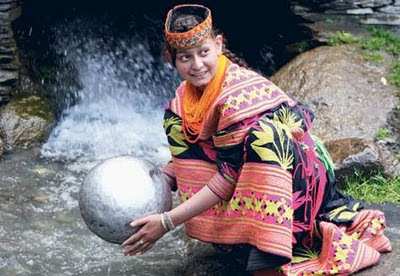 As mentioned, Kalash people believe stones, and trees have souls. This pretty well explains their similarity to Japanese people. Japanese and Asian people prefer spiritualism over materialism. This view gives rise to the situation of ‘being over doing’. Doing phenomenon of activity gives rise to struggle to achieve things and is a characteristic of American culture. On the other hand, being form of activity deals ‘with the notion of having a natural and given position in the society.’ This may also be described as a reason why it is difficult for Asians (especially from homogenous cultures) to integrate in other cultures. According to Kalash people, when God returns back their book to them ‘[a]t that time Kalasha people will surely become strong but until then they will remain scattered.’ This may explain how Kalash themselves feel that they are weak and in minority but they have a hope of good future with strength. Such assumption is truly linked to liberal idealism yet is deeply spiritual. American view of hope is linked to struggle for better future. They exploit nature for their welfare but Kalash people are waiting for God to come and fulfill the promise their forefathers did with them. When viewed directly, it appears that social relationships in Kalash culture are based on equality, but it is not true. Not only social relationships exhibit inequality but there is a gender inequality at force as well. For example, daughters don’t receive share in property. The eldest son is the head of the family after death of father. And during cultivation season landlord goes to the field to sow seeds and others follow him; same happens during harvest of the crop. When Kalash people harvest their crop they sacrifice an animal as well. Working as a group is characteristic of Japanese people and the same can be observed in Kalash culture. Like Koreans there is a hierarchy in place in Kalash culture. Relations are same as in Korean society i.e. ‘based on authority and subordination.’ This gives rise to high power distance. Working as a team will undermine individualism that is in contrast to North American culture. 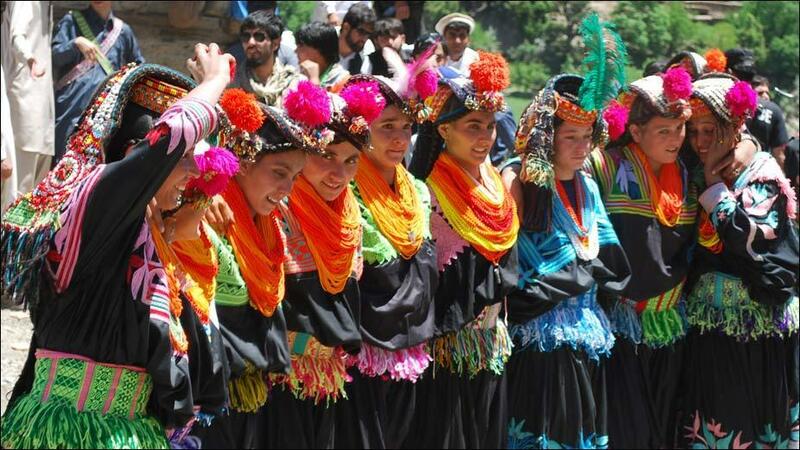 In Afghanistan property is not given to daughters in the light of inheritance code, it is the same in Kalash culture. This means that masculinity is in practice in Kalash culture. ‘Don’t walk in the native land of forest. ‘What sort of environment will be there? Some comes for meeting their beloved. Metaphysics make a large part of lives of Afghan, Indian, Tibetan and Japanese culture. One other important thing which is more visible in Kalash culture as compared to other Asian cultures is that the ultimate goal of life of Kalash people is to achieve and get high level of happiness and joy, and that is the reason that they have many festivals during the year. General public in Pakistan came to know about Kalash people only in 1970s and it was the time when Kalash was facing famine. There are some reasons which can explain why people didn’t know about them? First, Kalash people live an isolated life and still they can’t be seen in other cities of Pakistan. They have a limited life and limited desires, because of their spiritual nature, thus they don’t go to main cities of the country like Islamabad, Lahore, Karachi or Peshawar to earn livelihood, receive education or some other purpose. Second, Kalash valley is located in a mountainous region where the transportation system is underdeveloped and the only means to get there is helicopter or aeroplane. There are some roads leading to Kalash valley which are closed for more than six months every year because of heavy snowfall and land-sliding. Third, Pakistan as a state has never paid attention to Kalash valley, it was only Zulfikar Ali Bhutto who ‘averted the tragedy’ of famine and thus became hero of Kalash people. And finally, media resources were limited at that time and only National Radio and Television were available, newspapers were only for the literate class of Pakistan and were often under restrictions and were censured. After mid 1970s, another tragedy happened. When Soviet Forces entered Afghanistan, Pakistan started supporting Jihad against Red Army and this radicalized Pakistan’s Muslim population. General Zia Ul Haq’s military rule is considered to be the radicalizing period in Pakistan’s history by all known scholars of the region and abroad. Islamization of the country as well as converting non-Muslims took place during his reign. Tablighis started visiting Kalash valley and converted many Kalash people to Islam by force. This is what Abbas Zaidi calls ethnic cleansing of Kafirs. In his article he wrote: ‘The kidnapping and forced marriage and hence forced conversion of the Kafir women to the Muslims, mostly Tablighi Pathans, continues to this day. These women are not allowed to see their relatives unless the relatives also convert. It is no secret that many of these women are sold at auction. Men are circumcised against their will. The Tablighis carry Kalashnikovs as a matter of routine and have killed many Kafirs who resisted conversion to the Tablighi Islam.’ Zaidi considers poverty to be another important factor in conversion of Kalash people to Islam. It reminds the historical past of humans. The thinking that ‘if only people were more like us, then they would be all right to have around;’ can be clearly understood in Kalash’s perspective. Bennett is very much right that if we couldn’t convert people then ‘we killed them.’ Kalash people were indeed killed and are still facing threats from Taliban, Al-Qaida and other militant hard-line Islamic outfits in Pakistan. Pakistan’s state is also not doing anything to preserve this culture, but itself is accused of supporting and financing Taliban, and other militant organizations. As part of the people of Pakistan, the Developmental Model of Intercultural Sensitivity application is full of complexities. Given the situation that Kalash people are isolated and live their own life through their own way (as explained above) they can be termed as ethnocentric culture. On the other hand, Pakistani people (majority of them are Muslims) are also ethnocentric in terms of their religion and are isolated from Kalash people. Though Pakistanis go to Kalash valley as tourists but they never have tried to intermingle with them and neither did Kalash people do so. Putting aside destructive behavior of Pakistan’s state (as accused of supporting sectarian violence, militancy etc. ), the claims of Pakistani government to preserve Kalash culture don’t seem a reality because people from the valley as well as scholars and journalists complain about inadequate and insufficient attention of the people at the state level. The first responsibility of the state is to provide security to its people. Pakistan, it appears, to be failing in doing so (as described above). According to the people of Kalash, Pakistan came into being in 1947 and since then no school has been established there. State has not only failed in providing basic necessities of life including education, but also teachers in schools discourage and insult Kalash students in the primary schools functioning in Chitral valley (those schools were built by British Rulers which still function). On the other hand, because of the very low child birth rate, the population of entire Kalash community is between 3000 and 5000 (sources give different numbers). Under such circumstances, the difficulty level between two cultures seems very high and integration seems a mere dream. Rather Kalash culture is at the verge of extinction. 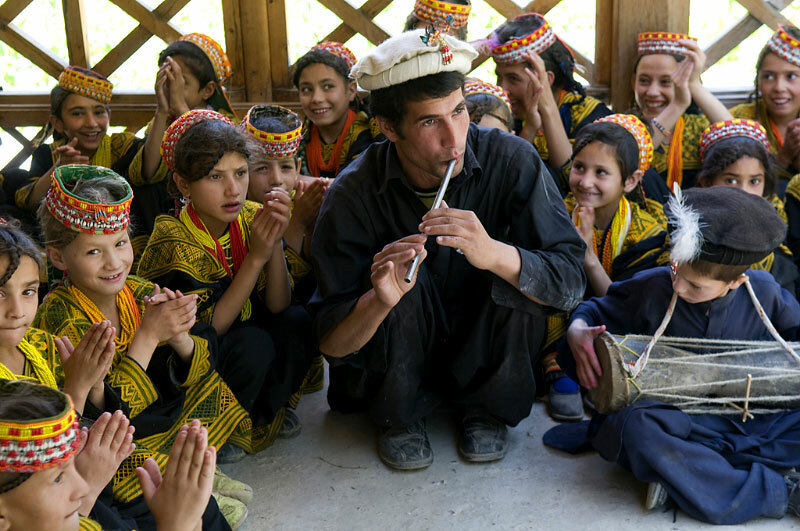 Recently, cross border attacks by Taliban in Chitral valley has not only disrupted the work of various NGOs (working to preserve the culture) but has raised concerns about forceful conversion of Kalash people to Islam. Under present circumstances, it is very difficult to change the behavior of majority culture towards minority Kalash people. Even during filling this paper a story unfolded that 37 Hindus converted to Islam in Matli sub-district of Sindh. Minorities are under extreme pressure in Pakistan because the society is indeed radicalized to a very high level. The first and extremely important point which is vital to Kalash people is to save them from extinction. The State should provide them better security and all basic necessities of life. Second, exposure and cohabiting on regular basis can bring about the difficulty level low. Third, Kalash students should be provided free of cost education from primary to higher level in order to give them better life and integrate them to mainstream Pakistani society without converting their religion and cultural beliefs as they are beauty of the Earth and a reminder of the living past of humans residing in Central Asia. Word ‘collectivism’ is not intended here to be synonymous with socialism in socio-economic meaning. Collectivism here means ‘living like a closely binding group’. Kalash: Culture Shock, retrieved from (http://tribune.com.pk/story/194101/kalash-culture-shock/) on December 06, 2011. Mayfield, James: Alexander the Great’s long-lost Greek descendents in Pakistan? Retrieved from (http://euroheritage.net/greeksinasia.shtml) on December 06, 2011. A brief history of Kalash, retrieved from (http://www.kalashwelfare.org/index.php?/about-kalash/the-history-of-the-kalash/) on December 06, 2011. Kafiristan means the land of infidels. Kafir means infidel in Arabic. Zaidi, Abbas: Ethnic cleansing of the Kafirs in Pakistan, retrieved from (http://india.indymedia.org/content/2003/04/4335.shtml) on December 07, 2011. Nuristan means the land of enlightenment. Nur means light in Arabic. Bates, Crispin, Dr. The Hidden Story of Partition and its Legacies, retrieved from (http://www.bbc.co.uk/history/british/modern/partition1947_01.shtml) on December 07, 2011. This line was drawn in 1893 by British Colonialists of India and they had divided Afghanistan into two parts. The eastern part’s control was given to British and the remained Afghanistan became a protectorate of Great Britain. This led to Third Anglo-Afghan War and eventually to independence of Afghanistan but the entire region on the eastern side of Durand Line fell to British which they included in Pakistan in 1947. Chitral is also part of Pakistan now. The Kalash and The Kalash Traditions, retrieved from (http://thekalashatimes.wordpress.com/the-kalasha-and-the-kalasha-tradition/) on December 07, 2011. Americans view the world as material. But it doesn’t mean they don’t have any spiritual roots or beliefs. The Kalash and The Kalash Traditions, retrieved from (http://thekalashatimes.wordpress.com/the-kalasha-and-the-kalasha-tradition/) on December 10, 2011. Kalash Poetry, retrieved from (http://thekalashatimes.wordpress.com/logo-of-kims/) on December 11, 2011. Ibid. When Will I Die? Kalash Festivals: retrieved from (http://tribune.com.pk/story/178151/preserving-kalash-culture-the-big-fat-greek-festival/, http://thekalashatimes.wordpress.com/the-kalasha-and-the-kalasha-tradition/ and http://www.kalashwelfare.org/index.php?/about-kalash/the-history-of-the-kalash/) on December 11, 2011. Zaidi, Abbas: Ethnic cleansing of the Kafirs in Pakistan, retrieved from (http://india.indymedia.org/content/2003/04/4335.shtml) on December 11, 2011. Tablighis are Islamic Preachers who travel inside the country and go abroad to convert people to Islam. Tabligh is Arabic word which means ‘to preach’. Walsh, Declan Taliban threat closes in on isolated Kalash tribe, retrieved from Guardian (http://www.guardian.co.uk/world/2011/oct/17/taliban-kalash-pakistan-afghanistan) on December 12, 2011. Analysis, retrieved from (http://thekalashatimes.wordpress.com/analysis/) on December 12, 2011. 37 Hindus convert to Islam in Matli, retrieved from (http://tribune.com.pk/story/305697/seeking-social-status-37-hindus-convert-to-islam-in-matli/) on December 13, 2011. 5. Hussain, S. & Zaman, S. Land, Culture and Identity: The Case of the Kalash, Reclaiming Balance: Indigenous Peoples, Conflict Resolution and Sustainable Development. Tebtebba Foundation. 2004. Brilliant. We need more of these types of in-depth study of cultures. False acquisitions make this study not worthy of any value. There is NO pressure on any NON MUSLIM living in Pakistan. Osama was an American Rouge Agent. That mess has nothing to do with kalash people. Most of the references are from indian media which are totally wrong.